Find trucking school financing for students wanting to go to truck driving school. As the economic upturn continues, trucking schools are experiencing a spike in enrollment as many people look for new careers, as truck drivers. Trucking will remain an important part of the economy since nearly everything consumed in this country is transported by trucks. High enrollment at trucking schools across the United States is expected to remain high. Truck driver training is expensive; the average cost of training is nearly $7,000. I’ll show you just a few ways to finance your new career. Federal Student Aid Students at truck driving schools are eligible for federal student loan programs, federal student loan programs just as students attending traditional colleges and universities. You can submit a FAFSA (Free Application for Federal Student Aid) online to receive federally funded or federally guaranteed financial assistance. Federal loans are borrowed money that must be repaid (with interest) upon completion of your education. 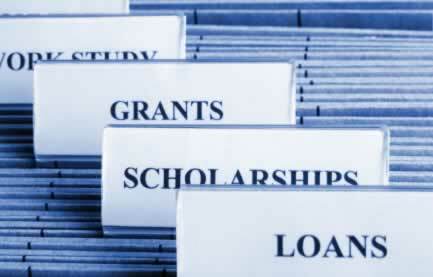 Federal Grants – Sometimes referred to as Gift Aid, certain people qualify for grants which do not have to be repaid. Grants are often given to individuals with low income, people who have served in the military, and much more. You can fill out a FAFSA for trucking school financing to see what grants you are eligible for or visit. The amount of a grant given depends on the individual’s needs. Workforce Investment Act – Passed in 1998, the allots federal funds that are used to help train disadvantaged and dislocated adult workers and youth. Veterans Employment and Training – If you are a veteran, you can take advantage federal student loan programs of the which provides funds to train veterans, reservists, and National Guard members. Veteran Affairs Education Benefits You may be eligible for VA education benefits that can cover the cost of you trucking driving school education. Vocational Rehabilitation – If you are a veteran with service-related disabilities, you may qualify for The Department of Veterans Affair’s Veterans Benefits Administration’s Vocational Rehabilitation and Employment (VR&E) vocational rehabilitation which enables vets to retrain for a job in the workforce. Employer-Based Financing – Most CDL trucking schools offer employer-based truck school financing in which they will pay your tuition with a predetermined interest rate. The terms of the financing will vary with each company, so ask about them before signing with a trucking company. Tuition Reimbursement – There are many truck driving companies that will actually pay for your trucking school financing if you agree to work for them after graduation. There’s typically a minimum amount of time you must work for them in order to not have to pay the tuition back (generally two to three years). Of course the best way to find financing is to talk to the financial assistance counselor at the CDL training school you wish to attend to find out what all your options are. They can help determine which would be best for you and your financial situation. choose this route, keep in mind you may be eligible for tuition reimbursement through some trucking companies. WIOA funding is Available to help enhance training and employment for individuals facing barriers to employment.